I cringe every time I catch myself doing this. We are starting our bedtime routine and the bedtime tantrum begins. As soon as my son knows bedtime is starting, he weighs in with “No sleep, no rest, no bath.” This is his response to everything. This chant—no sleep, no rest, no bath—it’s basically his life motto. When you put your kids to bed, they act like they’ve never slept before in their life. Kids act like sleep is poison. I get so frustrated with all this “no sleep, no rest, no bath” chanting. The anger boils up inside me until my brain is filled to the brim with irritation. This usually leads us into a power struggle. Why is it that all a parent wants to do is sleep and kids don’t? The sleep approach you’re missing. Sleep is a gift. Sleep is a treasure. As adults, you and I know this. All we want to do is finally get some sleep. To take a nap. To sleep all night and wake up to breakfast in bed (or…at least coffee!). But here’s the problem: I was treating sleep as a consequence to bad behavior. Sleep is not a consequence. Sleep is a gift, and I was practically begging my child to fight me at bedtime by treating it as a consequence. 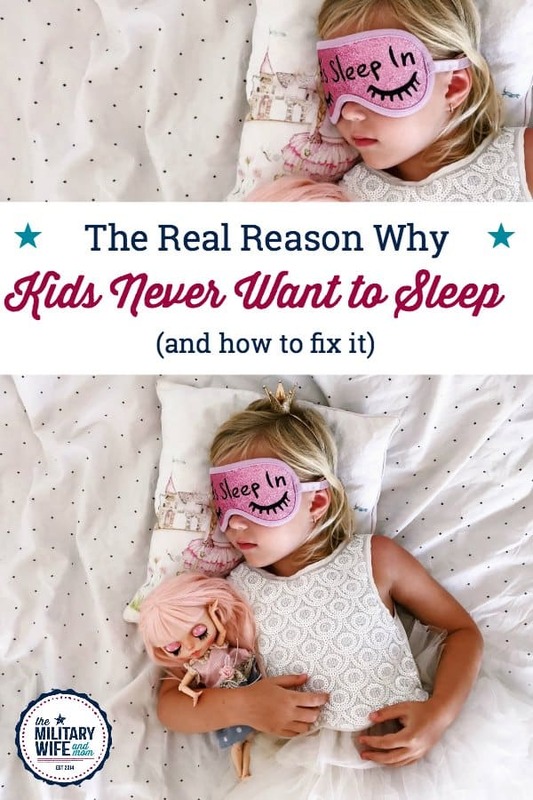 How to fix your approach to sleep with kids. It’s time to re-frame the idea of sleep and help kids see it in a positive light. Sleep heals our body. 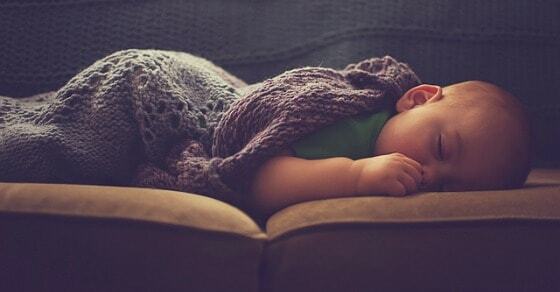 Sleep gives us energy. Sleep helps our brains learn new skills and process the day’s events. It’s the building block of child growth and development. Another friend of mine says, “Let’s go have our comfy time together.” And they put their jammies on and snuggle together in bed. Step 1. Remove sleep as a consequence. If he refused to brush his teeth, the consequence was no treats or candy. If he refused the bath, here’s how we fixed that problem. But to be honest, most of our bedtime routine battles faded away after following step two! Step 2. Approach sleep positively. Step 3. Talk to your child about how sleep helps. Saying and talking about these ideas throughout the day can help your child transform the way he or she thinks about sleep. Step 4. Encourage activities that talk about sleep. Have your child draw a picture of everything that happens in their brain when they are sleeping. Have a pajama race and whomever gets their pajamas on the fastest wins the game. 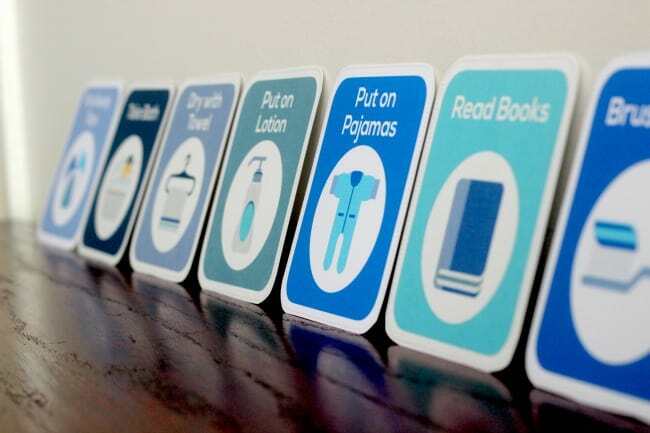 Allow your child to follow a routine using a set printable routine cards. All of these activities build connection with your child and helps them have a positive association of sleep. When kids laugh and play, they enjoy learning and are more likely to remember new information. Tonight my son put his pajamas on, climbed on the couch with his red gummy night light, and patted the cushion three times to signal it was time for me to sit for our “comfy time.” I headed over and snuggled up next to him. Together we read two stories together–one about taking a mouse to school and another about pandas. After reading our stories, he hopped off the couch, gave me a kiss and ran off to his room for bed. I followed, and when I got there, he was under the covers waiting for me. Ugh, I am so guilty as using naps/sleep as a consequence. Thank you for the wonderful post. I am going to stop doing that right now! Never too late to turn it all around! I have 16 months twins, and sleep training so far has been flowing smoothly. My boys sorta showed me how to approach nap time and sleeping time. I would get them ready every day at the same time and read a book and straight to bed. I also purchased a sensory night light and it also helped, even though I wasn’t having any trouble to begin with. Hopefully they get older it doesn’t become an issue. Tips on getting kids to like or want to brush their teeth!!! Tooth tips: We play relaxing jazz music on our phone and ocassiinally childs choice music. We brush with them. We have a kid mirror they can hold. We tested different tooth pastes to find the winning flavor. I have problems with m 10 year old going to bed, acts up has a tantrum every night. Dear one, your “rebel” child (I’m assuming still young?) would never believe his mom and her love do not matter. There is a disconnect between you, and you CAN find the broken link and start this relationship back on its way to healing. Do you always label him in your mind and out loud as rebellious and difficult and impossible? No mama shaming! I have done this, we all have. But we learn and we change. No labels. Let him screw up. Let him be opinionated. Another blogger said – is this particular situation with your child going to even be relevant in 10 years? If yes, then keep enforcing your rule/boundary/whatever (like kindness – you still want him to be kind in 10 years). If no, then just drop it. Choose your battles. (Like, never putting on pjs? OMG, let him sleep naked or in a superhero costume. It truly does not matter.) Also, check out more of Lauren’s writings (I pin a lot of them!) and check out Positive Parenting Solutions or something similar. You owe it to yourself and the rest of your life as a mom to this boy to fix this relationship now. Someone also said, “Speak to your children as if they are the wisest, kindest, most beautiful and magical humans on earth, for what they believe is what they will become.” (Brooke Hampton said it? Whoever that is.) You want your boy to be himself, strong willed, but in a good way. You need to speak it into his life. Believe in him. He needs you, dear mama!! Arg! I used to be so good at this and my oldest child loved sleep and then somewhere between child 2 and 3 I started using bedtime as a consequence and now no one loves going to sleep. I resolve to start this at our next nap. I will teach my kids my love of sleep! Looking forward to reading more of your tips. Thank you!